Our annual conference, ‘Unleashing the Power of Innovation’ was held on October 27th at the Helix DCU and was a great success! We had a diverse group of international speakers as well as an array of companies represented, both as exhibitors and attendees, to collaborate on the power of practically applying innovation for a better tomorrow. Our opening speakers included Darrell Mann, Dr. Marc Sniukas and Roel De Vries. Darrell spoke on the contradiction of chaos. 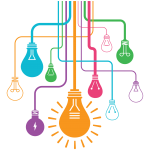 It can be bad and yet it can be the catalyst for change and innovation. He encouraged attendees to embrace the complexity – when in chaos, as ‘what is the opportunity?’ Chaos can appear to be a negative, when in fact, change only happens in chaos. The most resilient organisations operate at the edge of chaos. Marc Sniukas surprised and delighted us by opening his presentation with a clip of a rock & roll band, which was a lead-in to the possibilities for growth outside what is commonly known. The band gave away their core product for free and yet made 1.7 million in revenue. Marc shared insights and practicalities of how to develop a new model for business growth. At first glance, Roel De Vries’ presentation was a case study of the success of the Spark Programme within Liberty Global. Yet it was so much more. It was a story which intrigued, instructed and showed the power of collaboration to break the boundaries that can hinder innovative growth. He gave insights on how Liberty Global have engaged employees right across the business in innovation and how you too could take your collaborative innovation programme to the next level. In addition to a fantastic lineup of speakers, attendees enjoyed mingling with exhibitors from some of Ireland’s most innovative companies and networks. Over 40 companies and colleges reached out to delegates to share their capabilities and expertise, paving the way for new collaborations, business opportunities and innovations. Throughout the day, the cross-sectoral nature of IRDG’s membership was represented through the 5 minute Innovation vignettes from Dell EMC, Morgan McKinley, Allergy Standards, Netwatch System, InnaLabs, Stryker, Action Point, Silver Pail Dairy & DCU. The break-out sessions were a time for guests to get their hands dirty and delve into the practicalities of strategic thinking, to play with the tools used in Liberty Global’s Matchbox Programme and understand the habits of highly effective innovation projects. Illustrator Philip Barrett stood outside of the main auditorium and depicted in art the core message of each speaker. A picture tells a thousand words they say, and how true it is when you see the creative and artistic interpretation of all the day’s presentations – a really useful take away and memento of the key points. (Click on the graphic to see more). The day ended on a high note with Paul McNeive sharing his inspirational story of recovery from losing his legs, to establishing a successful multi-million dollar business using the same skills he acquired regaining his strength and mobility after the accident. The plan of baby steps. Moving one degree more each day was negligible and achievable, and taking these small steps enabled him to return to an active lifestyle, walking and dancing and living life. Goals too big to imagine are achieved by taking just one step at a time. 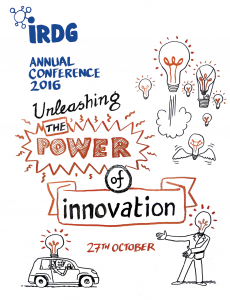 IRDG Conference – Unleashing the Power of Innovation from IRDG on Vimeo.